This page contains some information about origins and history of OGN trackers. OGN tracker design document by Sylwek. 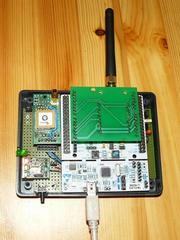 It produces packets in OGNTP format (on 8-bit AVR and 32-bit ARM CPU's) and sends them through using SPIRIT1 RF chip. 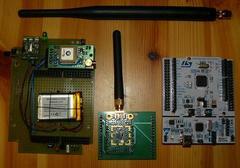 Tests with CC1101 RF chip were done and successful! 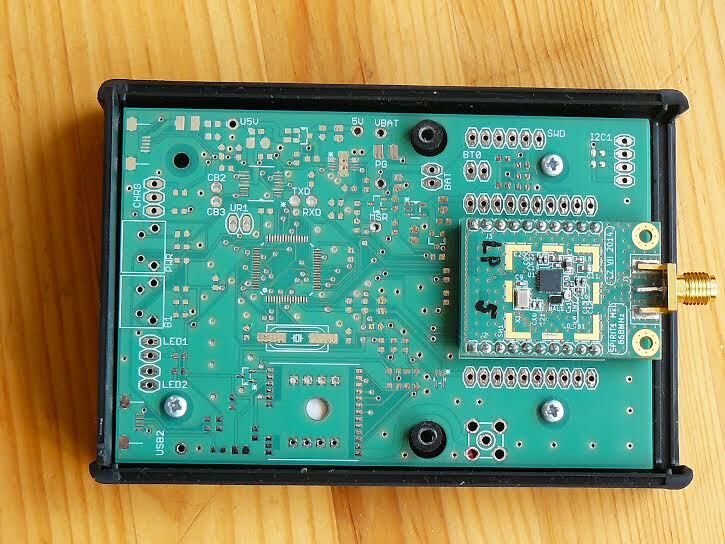 Tests with RFM69 RF chip are underway. The core developers involved in the "OGN tracker" project are not newbies in the subject of glider tracking systems. They have got experience working on a similar solutions over past years. In 2008, at ZAR (Poland), a small group of friends and glider pilots started a tracking project with the aim of creating a low-cost and working solution for the upcoming Sailplane GP event. Thee is also a version in English, based on the original one and presenting the basic concepts of "early" OGN. It also refers to Zarbrick project and the tracker. Although today's OGN trackers use different technology, it is important to note that several interesting concepts where already discussed, proposed and implemented in 2009, such as e.g. message relaying between trackers increasing coverage. These ideas are now being implemented and extended by OGN tracker. And here it is! Nice and ready!! 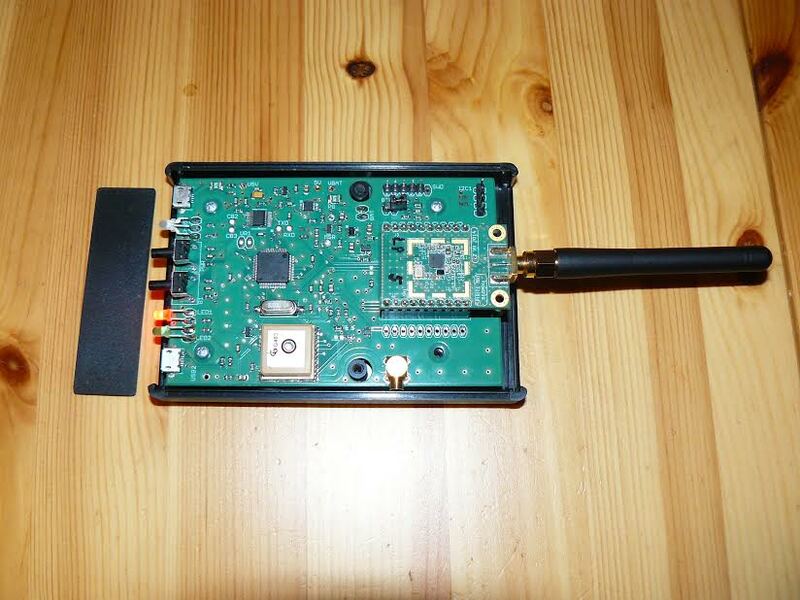 GPS connected, still a few elements missing. - in idle 50mA - from which 15mA is taken by the CPU (for now unlimited) - that can most likely be reduced to 5mA. It gives ~24h operation time. - in the "soft power off" state - 100uA - quite significant, but taking into account the battery (1350mAh) the discharge time is long enough. Time to start soldering the components! More OGN tracker field testing were conducted! I selected two hills that are visible from EPZR station. Prusow hill (23.3 km): signal to noise = 20 dB. Bendoszka Wielka (42km): S/N over 10dB (maximum 15) - packet reception was stable. Hi. I want to share some news about OGN tracker. 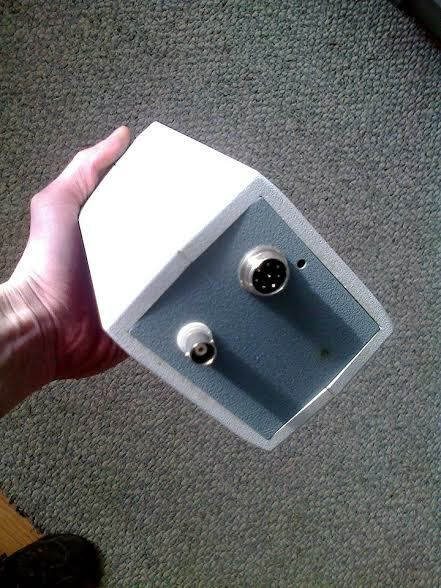 We created two prototypes combined from different modules prepared previously (pictures below). Although it looks funny, with such prototype we could solve most of design problems and also prepare software. - Li-po battery and charger. 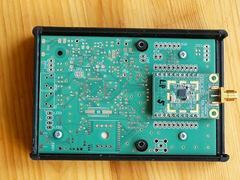 Tracker consumes 50mA and works (transmits) at least 18 hours on 950mAh battery, but it could be improved to 40mA at least. 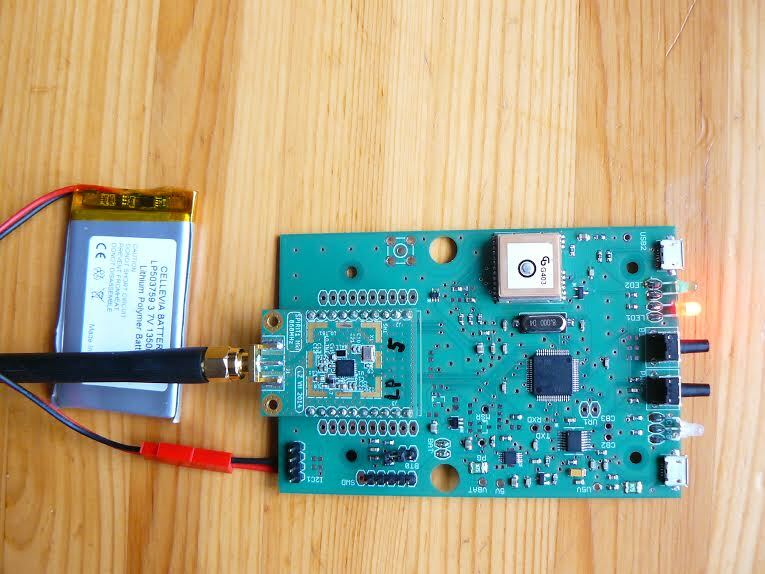 We already have positive RF measurements results from lab, but after all we wanted to see some real life results. Using EPZR dual mode station we found two places 3 and 10 km away that offered line of sight to antenna (unfortunately no flights were possible during testing day). 30mW transmit power on long antenna: S/N ratio: 33dB. 10km distance results - Soła river bridge near Żywiec. We drove two times over the bridge - with short and long antenna. Tracker was attached to side window in our car. Surprisingly results are similar - 3dB difference from 3km point isn't clearly visible this time. Overall: signal is strong and we are expecting way more than 10km range. First version will be very simple (and cheap), because we want to sure that we prepare something for incoming 2015 season. It could be called - "reference design" for other designers if they want to prepare it's own compatible trackers. Please note that Spirit1 module could also receive other OGN trackers - we will experiment with packet relaying for increased range. November 2014: Preparing for tests in the terrain! 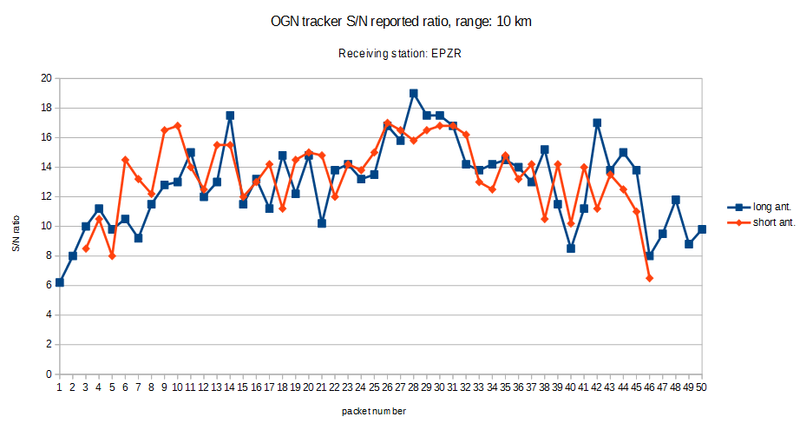 More news + some photos of the OGN tracker - soon! 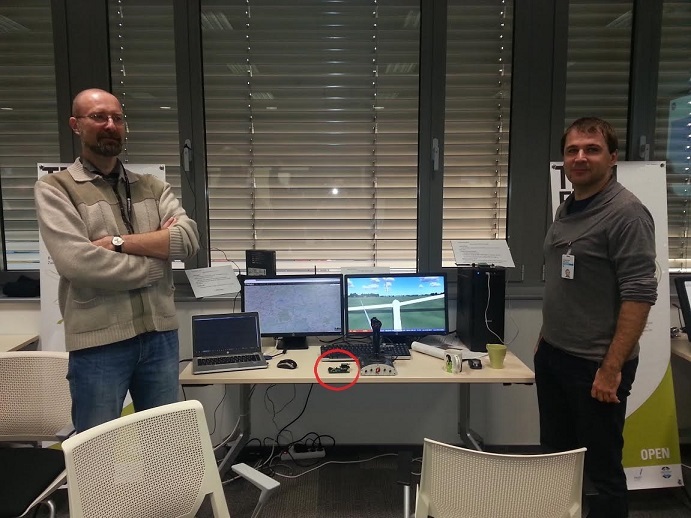 October 2014: First working version of OGN tracker prototype was presented in Krakow, Poland. Big Thanks and Bravo to our colleagues Sylwek and Leszek! Great job! Condor Competition Soaring Simulator serving GPS NMEA data to the OGN tracker.